Parents will recognize this scenario: You’re sitting around the house and the kids are absolutely bouncing off the walls, driving you nuts. You want to find some healthy activities to do together as a family that will help the kids burn some energy but feel sapped from work and being a parent and just can’t think of anything. Who among us hasn’t struggled to find fun things to do with our kids? With spring now officially sprung and the deadline for submitting entries to our “Make the Play for Healthy Habits” kid video contest just five days away, we’re turning our attention this week to fun, healthy activities that parents can do with their kids. When you engage each other in healthy activities, you’re also passing along great habits to your children. Head out to the park and roam. Find a large space, like Belle Isle in Detroit or the Nichols Arboretum in Ann Arbor, a state park or a Metropark, and let your kids run free. Take them for a hike through the woods and pretend you’re explorers. Indulge them in their “Star Wars” fantasies (my son’s current obsession) or whatever else floats their boat. Hit the jungle gym. Pack a picnic lunch and make an afternoon of it. Go to the zoo. This is a great way to get your walking on as a family. Go for a bike ride. 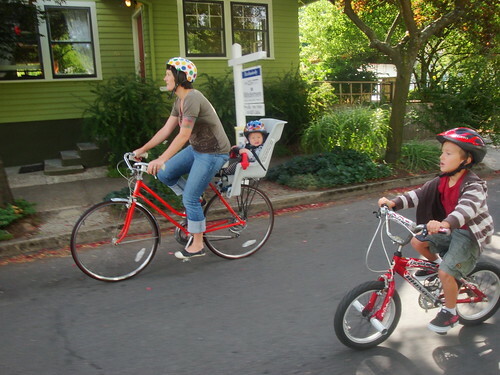 Get a bike trailer or bike seat for your young children. Head out for a run. Use a running stroller if your kids are young. Doing this for years with my oldest seems to have paid off — he voluntarily ran his first kids fun run recently during the Corktown St. Patrick’s Day parade race. Hold a jump-rope, hopscotch or hula-hoop competition. The latter two will help kids build bone strength and adults build agility and cardiovascular endurance. Hula-hooping provides a cardio boost and works the hips, abs, thighs and other muscles. Go swimming at the local pool, watering hole, lake or whatever else you like to jump into. Even running through the sprinkler can keep young kids happy for hours. Head to the farmers market. It’s fun to walk around together, and buying fresh, healthy food sets a great example for your kids. Hold a dance party. iPods, schmi-Pods; fire up the old living room stereo with your kids’ favorites and shake it. I’ve been doing this with my 4-year-old now for years. His favorite is when I combine swing-dancing moves with moderate roughhousing to give him a good whirl. Go rollerskating. Find a roller rink in your town. They still exist! Or try ice skating. Many indoor ice rinks hold open-skate sessions, or try an outdoor rink in season like the one at Campus Martius inDetroit. I could go on, but the point is to get you thinking of out-of-the-box ways to have fun together as a healthy family. What healthy activities have you found to do together as a family? Congratulations to the #MIKidsCan Play like a Lion Winners!